Rabat - Morocco’s Boxing champion Mohammed Rabii was named the World Series of Boxing (WSB) boxer of the year 2015, at International Boxing Association (AIBA) annual awards in Doha, Qatar. 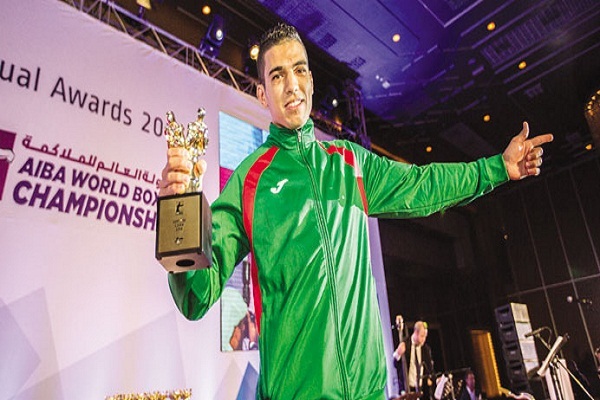 Rabat – Morocco’s Boxing champion Mohammed Rabii was named the World Series of Boxing (WSB) boxer of the year 2015, at International Boxing Association (AIBA) annual awards in Doha, Qatar. The African Confederation Boxing champion Mohammed Rabii received this recognition on Tuesday night, following an outstanding season. The welterweight will be looking to keep his unbeaten record tonight, when he will fight for the gold medal of the AIBA World Champion, in the 69 kg category. Mohammed Rabii will face Kazakhstan’s defending AIBA World Champion, Asian Games winner and ASBC Asian Champion, Daniyar Yeleussinov. Rabii has already made history for Morocco when he made it to the final of the AIBA World Champion, becoming the first Moroccan boxer to reach this phase. The whole Arab world is cheering for Mohammed Rabii as he is the only Arab boxer in the World Championships finals. Rabii defeated China’s Wei Liu in the welterweight semi-final on Monday. ‘’I am confident, I had an interview with the media today and said I was going to win and I did, I have qualified for the Olympics and I know what I need to do now in the final to win,’ he concluded. One of the biggest worldwide boxing success stories of 2015, Rabii ranked number one in Welterweight in Season V of the World Series of Boxing after seven consecutive victories, and qualified for the Rio 2016 Olympic Games in the process.